The sad news that an iconic orca had passed away was announced early 2017. This orca was Southern Resident ‘Granny’ (J2) and she was known for her old age. The media even talk about 105 years. But how do we know that for sure? And what is the maximum age to which orcas can live? Granny was an orca from the Southern Resident population. 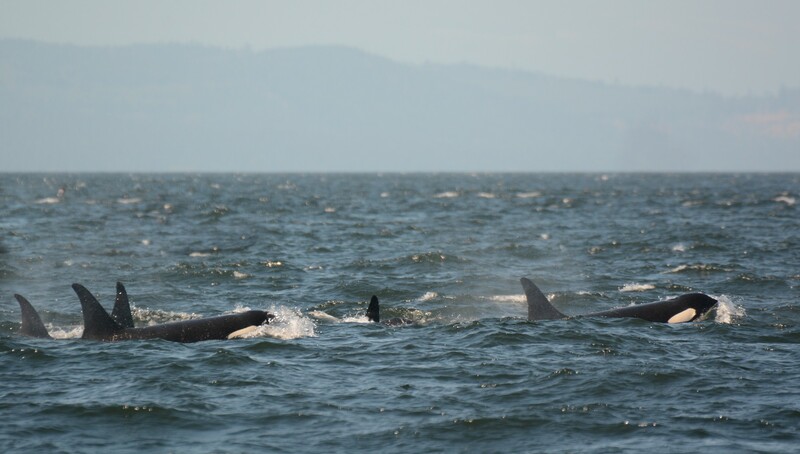 She could often be found around the southern part of Vancouver Island, together with other members of J-pod. Researchers from the Center for Whale Research saw Granny for the last time in October 2016. New encounters with her group followed thereafter, but she was not around. This led to the conclusion that Granny had passed away. Granny was not just any orca; according to some estimations she was born in 1911, and thus the oldest orca in this population. Her 100th birthday was even celebrated in 2011. But is Granny really more than 100 years old like is often said in the media? And how was the estimation of her age established? Since orcas have not been studies over 100 years yet, it is difficult to say to which age they can live. The Southern and Northern Resident populations are the best and longest studied orcas in the world, but even the research on them started in the 70s. From that time on, the dorsal fins and saddle patches of all the orcas were photographed. As a result, individuals could be identified. And by taking new photos on a regular basis it is possible to follow individual orcas for years. In Granny’s case, there are a few possible explanations why 1911 could have been estimated as her year of birth. 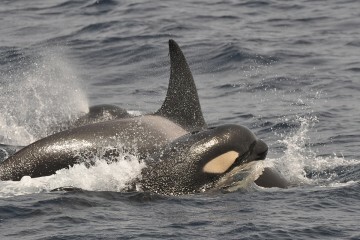 If it is assumed that orca J12 was born in 1935 and that she was a daughter of Granny, the variables above might indicate that Granny was born around 1911. The male J1 could give another explanation, one that was probably used. J1 was photographed for the first time in 1971 by scientist Michael Bigg. He was already fully grown then and was estimated to be 20 years old, with 1951 as year of birth. Since J1 and Granny were often seen together, and Granny got no new calves, it was assumed that J1 was her last-born son. In that case, Granny had to be about 40 years in 1951, which would make 1911 her own year of birth. Since the age estimations of the adult orcas from the 70s are based on many assumptions, there is a fair chance that mistakes were made. This is probably also true in Granny’s case. DNA studies confirmed that J1 was not Granny’s son. 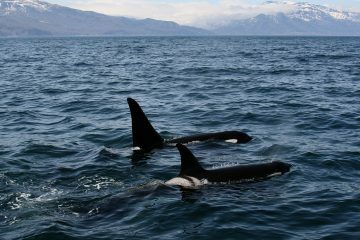 And a direct family link between Granny and J12 or other orcas was not confirmed either. 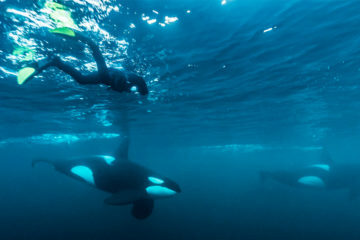 It also appears that there is not always a direct family connection between orcas that spend a lot of time together. 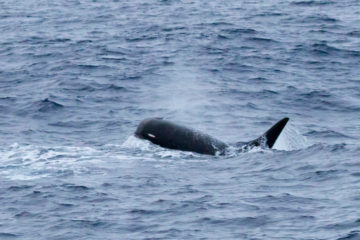 For example, in the years before her death, Granny was often seen with Onyx (L87, born in 1992), but Onyx is not directly related to her. The mother of Onyx died in 2005. Since that time, Onyx attached himself to other older female orcas. Actually, the only certain fact is that Granny was at least about ten years old at the start of the study in the 70s, because she was fully grown. Therefore, it might be very plausible that she was born in the early 60s or a little earlier. Another analysis also concludes that Granny was born later than 1911. A recent biopsy taken from Granny was studied. The fatty acids and other chemicals indicated that Granny was probably between 65 and 80 years old. But her exact age will remain unknown. 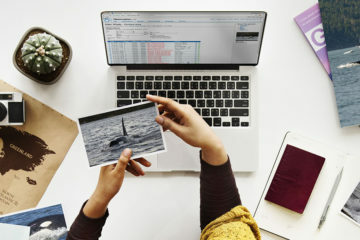 The 2014 (Spring Edition) photo-identification catalogue of the Southern Residents included 80 orcas that were alive at that moment. 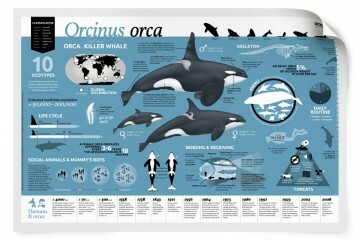 Of these 80 individuals, there are only two orcas included of which their age might be inaccurate due to estimations. Beside Granny, the year of birth of Ocean Sun (L25) was estimated as well, in her case it was 1928. The graph below shows all 80 orcas that were included in the 2014 catalogue, divided in age classes. Two outliers can clearly be seen: Granny and Ocean Sun. There is a big chance that these two orcas are not as old as initially thought, because the difference between their age and the age of the rest of the population is quite large. However, it should be noted that this graph is probably not representative for other orca populations, because the Southern Resident orcas have faced (and are still facing) many threats. 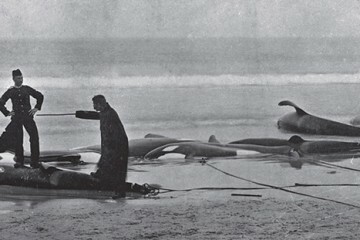 For example, dozens of young orcas were captured from this population in the 60s and 70s, to meet the demand for aquaria. The captures of those young orcas probably still influences the current composition of the age classes. In addition to the Southern Resident population, the Northern Resident population has been photographed since the 70s as well. This population has grown since the start of the study. With almost 300 individuals in 2014, this population is clearly larger than the Southern Resident population. 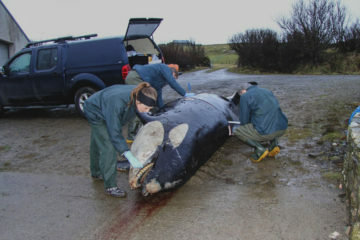 The year of birth of Northern Resident orcas that were born before the start of the study were estimated as well. 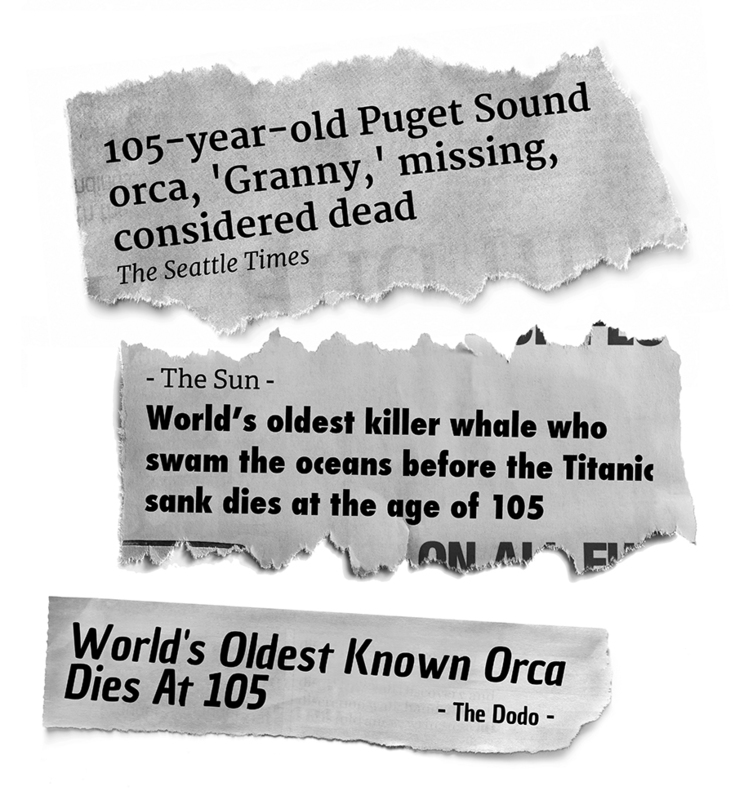 The data from 2014 shows three orcas that are older than 60 years. These are the females B7 and R5 which are estimated 65 years old at that time, and W3 who is estimated 79 years old in 2014. Again, there is a chance that the estimations are not entirely correct. 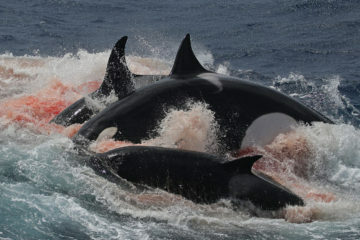 Notable is that all the old orcas in both the Southern and Northern Resident populations are females. It seems that many male orcas do not reach 40 years or beyond. The chance of survival for males in these populations is affected by a special factor: their mother. If the mother dies, the chance that her son dies in the year after her death increases. This is especially the case for sons that are 30 years or older. This is also true for daughters with that age, but to a lesser degree. So without their mother, sons have more trouble to survive than daughters. Caring for their adult sons is one of the possible explanations why female orcas live longer, even if they do not reproduce anymore. Female orcas enter menopause around the age of 40-45, but can still survive for many more years. This rather unique phenomenon in nature is only known in a few species, including humans. By taking care of her sons, the mother increases the chance to pass on her genes through her sons, without a direct pressure on her own family group. This is because the offspring of her sons, in contrast to the calves of her daughters, are born in another family group. However, males can reach an age of 40 years or older. 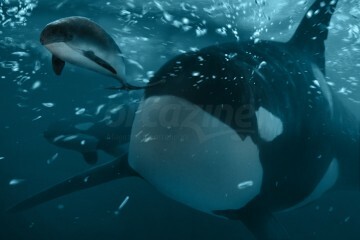 The earlier mentioned orca J1, also known as Ruffles, was photograph for the first time in 1971 when he was fully grown. Therefore, his was estimated the be at least 20 years old. Maybe this minimum age estimation was somewhat too high, since some males already have a large dorsal fin at fifteen years of age. At the end of 2010, Ruffles was seen for the last time and probably died not long thereafter. When 1951 is used as his year of birth, he would have been about 60 years old when he died. Maybe he was actually slightly younger or older than that, but for a male he has reached a high age. 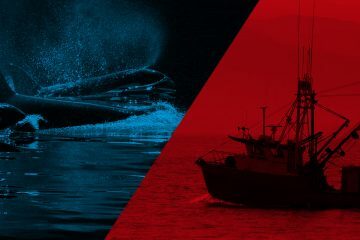 The question what maximum age an orca can live up to has no definitive answer yet, because there are still orcas alive that were already around when scientist started to photograph orcas for identification. We know for certain that these orcas are old (or have become old), but how old exactly is unknown. Granny was old, but the estimation of more than 100 years old seems incorrect. The maximum age for a female orca is probably around 70 to 80 years. For male orcas, this is somewhat less, with a maximum of about 60 years. 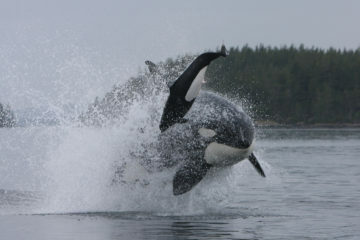 However, most of the orcas do not reach these high ages. Therefore, the average age is lower. More certainty about the actual maximum age of orcas will be known in the coming decades, as research on orcas will continue around the world.